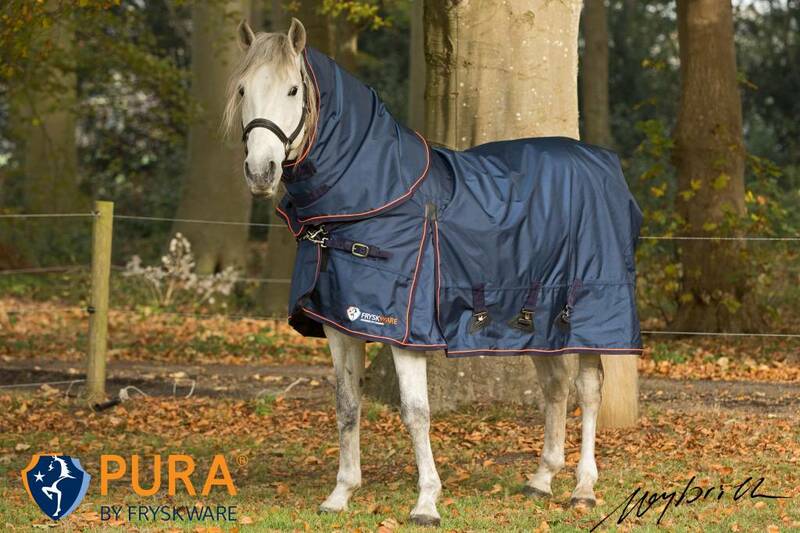 This is the ultimate outdoor cover for all seasons, especially for baroque horses and breeds with a wide front. 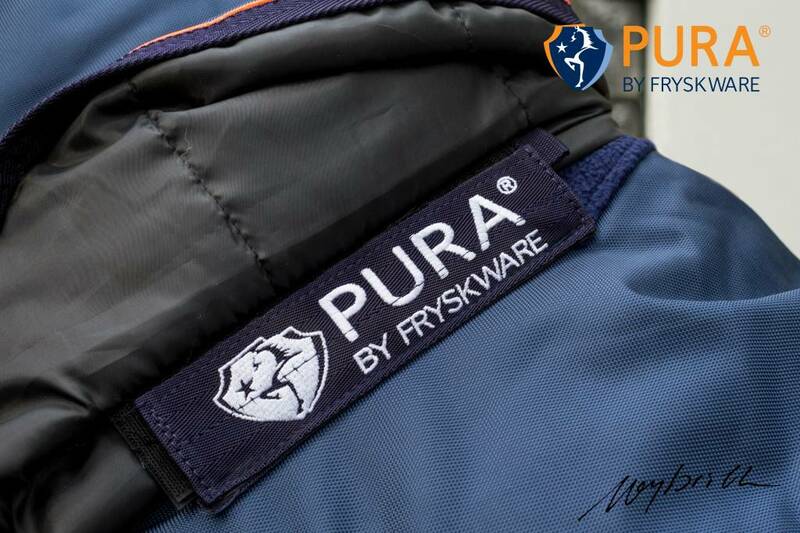 The Fryskware PURA Turnout is wind- and waterproof, maximum breathing and made of cast-iron ballistic nylon outdoor fabric in 1680 D Oxford with a smooth, antibacterial nylon lining in 210D with a temperature-regulating fibrefill filling of 50 gr. (rain cover) or 150 gr (rain/winter cover). 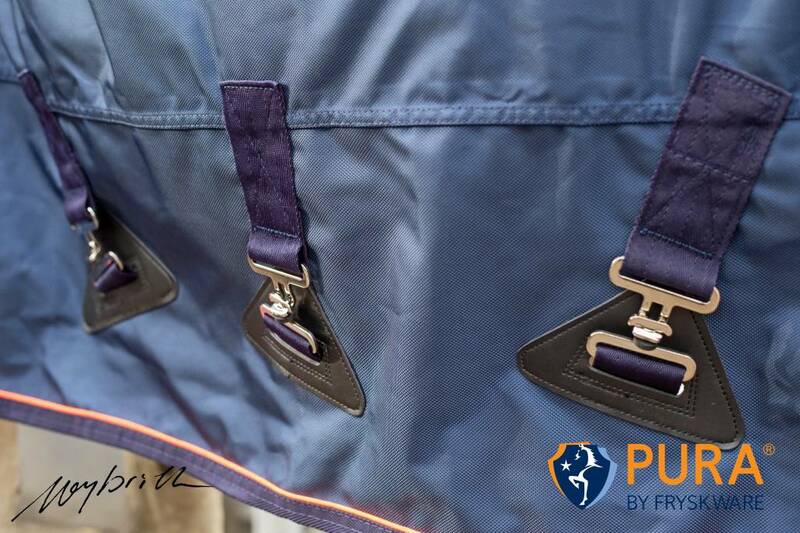 * Smooth, antibacterial nylon lining in 210D that prevents abrasions, repels dirt and doesn’t absorb any horse hairs. * Heat-regulating lightweight ‘thermobonded’ fibrefill filling of 50 gr (rain cover) or 150 gr (rain/winter cover). * Plasticized, elastic lag strap that can easily be cleaned. * Reflective piping around the horse, making it clearly visible in the dark. * Attachment straps for detachable neck (50 and 150 gr), rainproof. The lining of the Fryskware Perfect Turnout COMBOis made according to the Stay dry, stay cool, stay warm principle (antibacterial, breathing Teflon coating). You can lay this cover on a slightly sweaty horse. 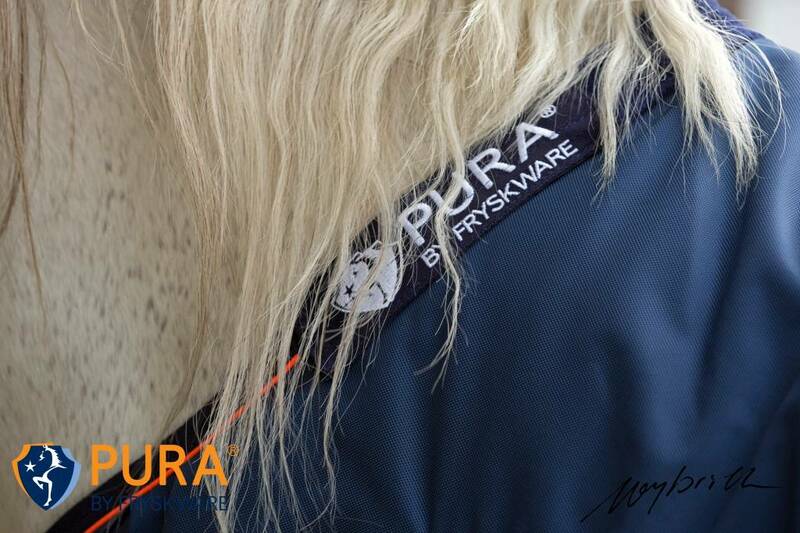 The lining of the Fryskware PURA Turnout COMBO is made according to the Stay silky, stay shiny, stay soundlyprinciple. This cover prevents abrasions, doesn’t absorb any hairs and ensures a shiny coat. Both covers have the patented fourfold adjustable FW45 Superfrontthat ensures a perfectly fitting cover for the baroque horse that gives optimal grazing- and freedom of movement. * Strong, water proof, max. breathing ballistic nylon outdoor fabric of 1680 D.
* Smooth, antibacterial nylon lining in 210 D that protects the manes, repels dirt and doesn’t absorb horse hairs. * Heat-regulating lightweight ' thermobonded' fibrefill filling of 50 gr. (rain cover) or 150 gr. (rain/winter cover). * Neck can be adjusted in 3 places, making it suitable for stallions as well. * Reflective piping around, making the horse clearly visible in the dark as well. * The smooth lining of the neck cover protects the manes of your horse. * Covered Velcro-straps to fasten the neck part quickly and easily to the Fryskware PURA Turnout (rainproof). 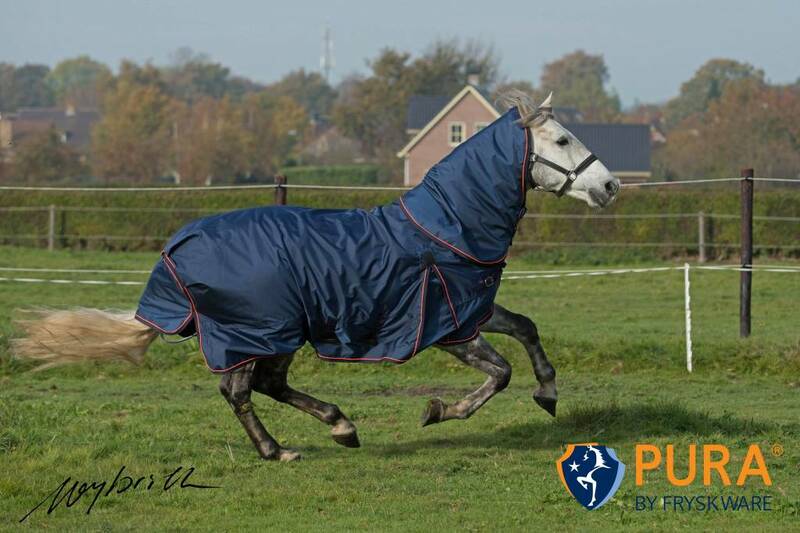 The fit of blanket rug is extremely important to ensure the comfort of your horse and to prevent rubbing and slippage. Horses with the same shoulder height come in a variety of shapes and sizes, it is useful to take certain measurements of your horse. Using a soft measuring tape, measure from (A) at the centre point of the chest, across the point of the shoulder and to the point (B) at the centre of the tail. When you have the measurement, remove 10cm (4inches) and choose your horse’s size from the table. Bear in mind that every horse is different and that this table is a guide only. 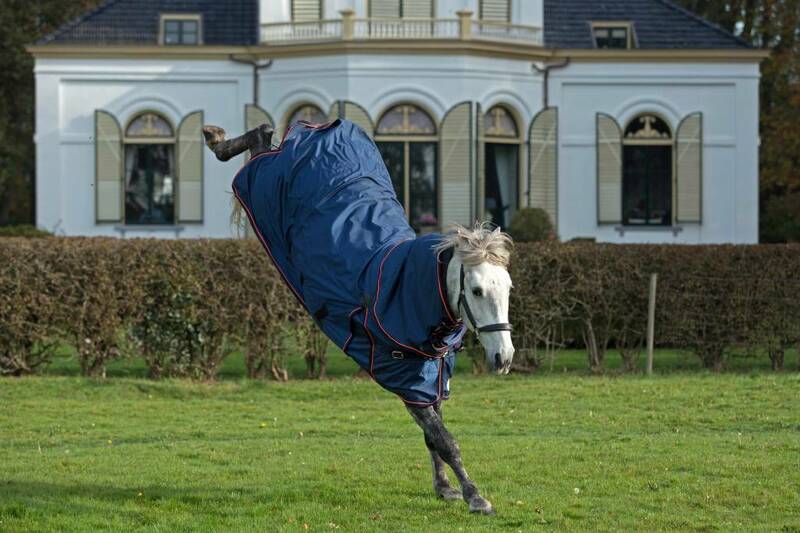 Given the mission of FryskWare (all horses outside as much as possible) the outdoor horse blankets are the perfect mix of technical innovation with the specific aspects of the Friesian and Baroque horse. 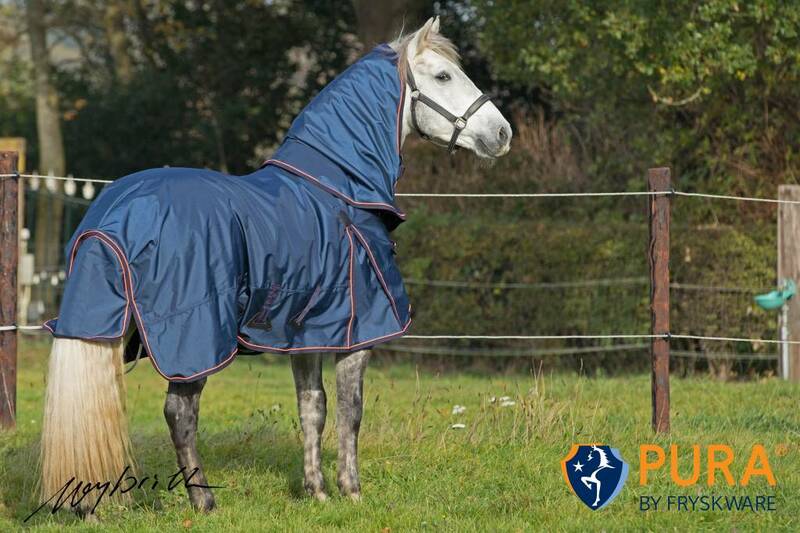 The entire assortment horse blankets of FryskWare focuses on fit, freedom of movement, protection and comfort. In order to cherish the fur colour of the horse (black remains black) and to protect the skin against harmful UV-rays the outside of the horse blanket has a UV protective coating. Main advantage: sunbeams cause less warmth, keeping the body temperature of horses in balance. The outside of the FryskWare outdoor blankets has a strong TEFLON, waterproof coating. Rain drops automatically slide down the blanket. In addition the blanket resists the most heaviest rain showers without harming the breathability of the blanket. Teflon makes the blanket dirt repellent and dust resistant. Mud and/or sand will automatically slide down the blanket when the horse enjoys a mud bath. 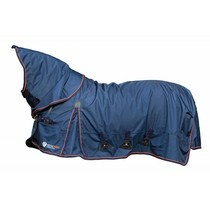 FryskWare blankets are made of cast-iron and durable 2100 Denier nylon making it demolition proof and extremely safe for the horse. 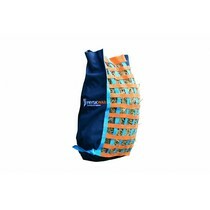 The outside is strengthened with fine Ripstop gauze fabric, extremely strong. The weave protects the horse against sharp objects and guarantees a possible opening won’t tear. FryskWare outdoor blankets are available exclusive of lining (0-gram) and inclusive of lightweight lining (100 and 200 gram). 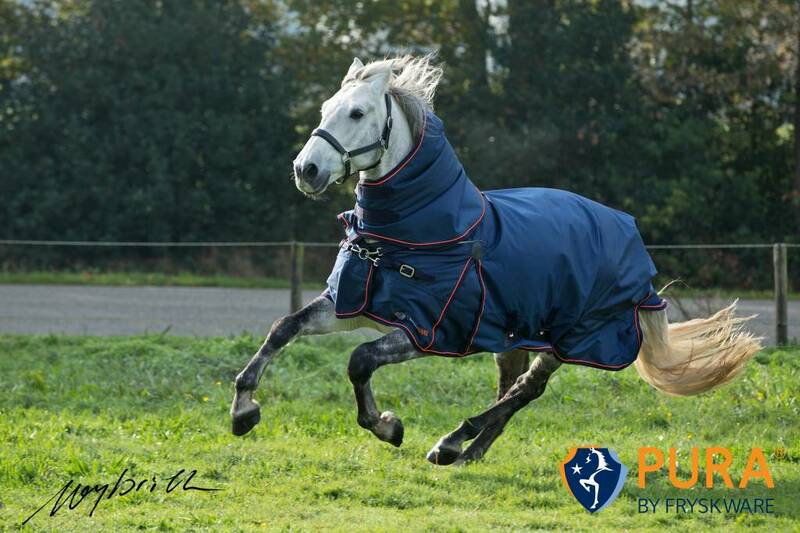 Lining protects the horse at all times against cold, frost, wind and draught. The temperature schedule varies from 5-15 Celsius (0 gram), around the freezing point (100 gram) and frost (200 gram). The lining is ultralight and insulates optimally. In addition, the thermal lining regulates the body heat of the horse. Thermal lining retains heat and avoids heat loss while excessive moisture can escape. 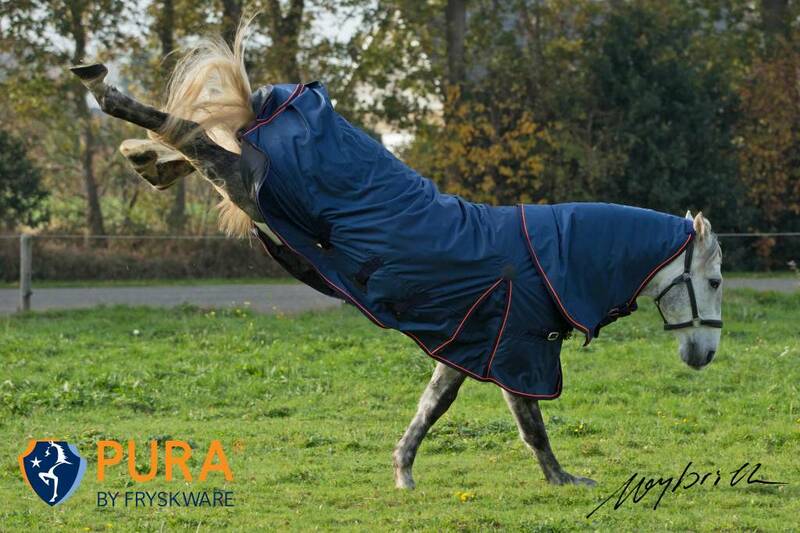 In close cooperation with owners and carers of Frisian and Baroque horses, Fryskware has developed the FW45 Superfront. It is a solid, fourfold adjustable breast closure in an angle of 45 degrees, guaranteeing a perfect fit. Another huge advantage of this patented system is that it gives the horse enough space to graze. The secret? The cut of the Fryskware blankets in combination with the FW45 Superfront system.